man" in Costa Rica, an 88-year old yoga devotee and decathalete in Okinawa, and a 107 year-old Sardinian who still climbs trees to harvest nuts for her family's Sunday meal, to name a few. By observing daily life in these communities, and conducting in-depth lifestyle research, Buettner's teams have identified the everyday behaviors and choices that correspond with the cutting edge of longevity research. In Sardinia for example, family comes first, a fact of life celebrated with big dinners that include red wine and simple, home-cooked foods. In Okinawa Japan, gardening and yoga are two popular activities, and life is governed by the principle of ikigai, which means having a purpose. In Loma Linda, California, Seventh Day Adventists attribute longevity to strong faith, family, and dietary restrictions that limit food consumption and promote a healthy, low-fat diet. 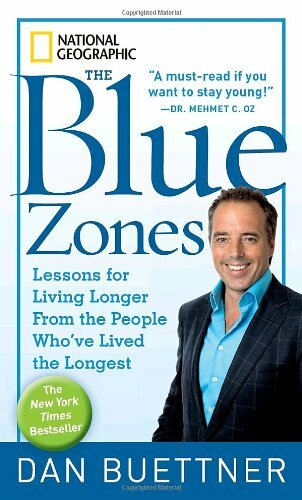 By distilling the key longevity behaviors from these wildly diverse populations, Buettner has derived recommendations for healthy lifestyle choices that anyone can make to create their own "Blue Zone" and promote long life. Buettner's inspiring examples of well-lived lives and easy to apply "best practices" from his studies empower readers to live longer, healthier, more fulfilling lives.